When using the DL1 mk3 to log data from the SPEEDBOX, the DL1 mk3 must be configured to take the required data from incoming serial data instead of its internal inputs, to store the required data to flash card, and not to output serial data itself. Step-by-step instructions to achieve this are given below. Note 1: These instructions apply to connecting a SPEEDBOX and DL1 mk3 only; if you wish to connect a SPEEDBOX, DL1 mk3 and a DASH then please contact Race Technology for advice. GPS gradient is not saved (affects logging from all SPEEDBOXs). Roll angle is not saved (affects logging from SPEEDBOX-INS only). Pitch and Yaw angles are only saved at 20Hz (affects logging from SPEEDBOX-INS only). Firmware updates to the DL1 mk3 are in development to remove these limitations, and this page will be updated once they are tested and released. 1. Open the DL1 mk3 configuration tool. 2. 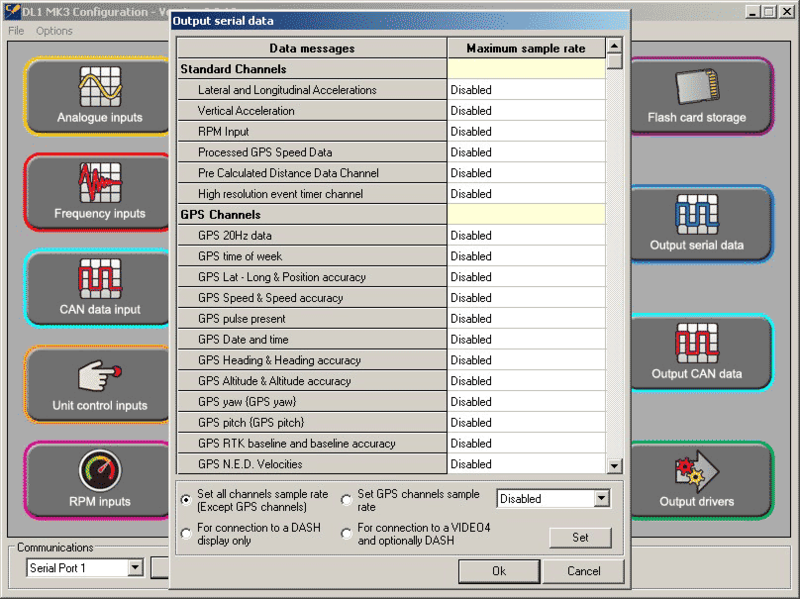 Click on the �Variable Mapping� tab. It is necessary to ensure that the variables that are to be logged from the SPEEDBOX are set to �Any serial port�, and NOT taken from the unit's built in sensors. Typically this will be the GPS receiver data and the acceleration values. If logging from a SPEEDBOX-IMU or SPEEDBOX-INS it may be necessary to scroll down and ensure that the attitude variables are also set to be taken from �Any serial port� as well. Figure 1 below shows setting up the variable mapping. 3. Next click on the �Flash card storage� tab. 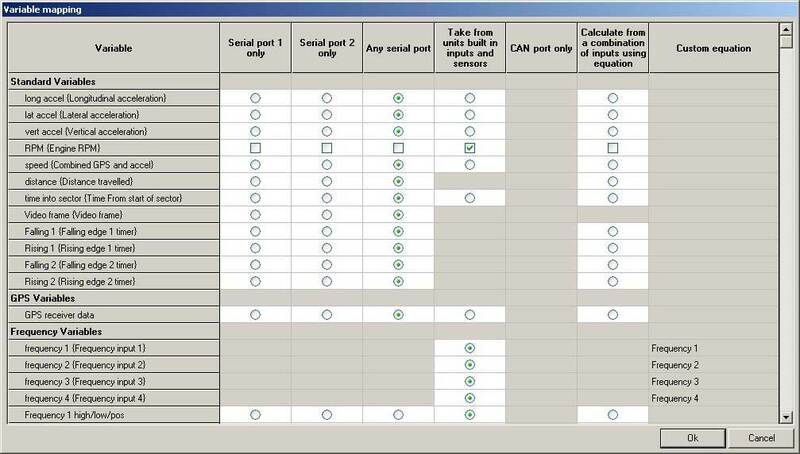 Then set the variables to be logged from the SPEEDBOX to be stored to the flash card at the required rate. 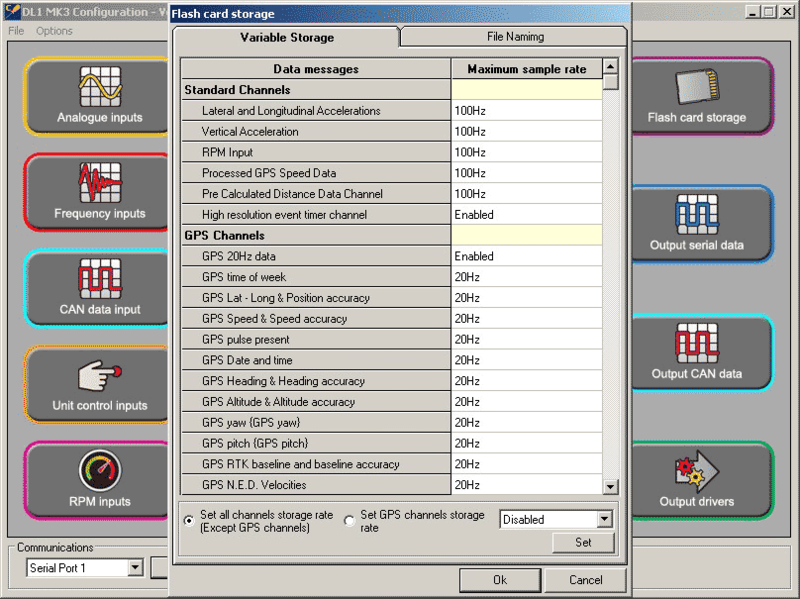 Figure 2 below shows an example, with the standard channels set to be logged at 100Hz, and the GPS channels set to be logged at 20Hz. If logging attitude channels then it will be necessary to scroll further down in order to ensure that they are configured to be stored. 4. Click on the tab labelled �Output serial data�. Change the �Maximum sample rate� of all messages that could be received from the Speedbox to "Disabled" (figure 3 below). 5. Finally, remember to send the changed configuration to the DL1 mk3! Once both the SPEEDBOX and the DL1 mk3 have been configured to work together, please connect them and test your logging setup to verify that the required data is being recorded prior to using it for testing.